8538. Ann F BYRON (Doretta M BERNHEISEL , Elmer E BERNHEISEL , Jacob BERNHEISEL , Abigail MAURER , Sarah BITLER , John , Johannes ). Ann married Russell F RHODES Jr.
13958 M i [Male] RHODES. 13959 M ii Dean Alan RHODES. 13960 F iii [Female] RHODES. 8539. Harlen BYRON (Doretta M BERNHEISEL , Elmer E BERNHEISEL , Jacob BERNHEISEL , Abigail MAURER , Sarah BITLER , John , Johannes ). Harlen married Pamela K "Pam". 13961 M i Douglas L BYRON. 13962 M ii Kevin BYRON. 13963 F iii Mary BYRON. 8547. Lois Irene BERNHEISEL (Billy Ray BERNHEISEL , Otto Collins BERNHEISEL , John William BERNHEISEL , Abigail MAURER , Sarah BITLER , John , Johannes ). Lois married Rev. David GILBERT. 13964 M i Timothy Marvin GILBERT. 13965 M ii Bill J GILBERT. 13966 F iii Kathleen GILBERT. 8548. Fred Ray BERNHEISEL (Billy Ray BERNHEISEL , Otto Collins BERNHEISEL , John William BERNHEISEL , Abigail MAURER , Sarah BITLER , John , Johannes ). Fred married Dr Susan E SMITH. + 13967 M i Dr Christoher Ray BERNHEISEL. 13968 F ii Dawn M BERNHEISEL. Dawn married Matthew A WEAVER. 8549. Rev. Robert Carl BERNHEISEL (Billy Ray BERNHEISEL , Otto Collins BERNHEISEL , John William BERNHEISEL , Abigail MAURER , Sarah BITLER , John , Johannes ). 13969 M i Robert BERNHEISEL. 13970 F ii Regina BERNHEISEL. 8555. Floyd KESLING (Russel H KESLING , Martha C BERNHEISEL , Henry BERNHEISEL , Abigail MAURER , Sarah BITLER , John , Johannes ). + 13971 M i Timothy KESLING. 8558. Wayne E KESLING (Russel H KESLING , Martha C BERNHEISEL , Henry BERNHEISEL , Abigail MAURER , Sarah BITLER , John , Johannes ). 13972 F i Hope KESLING. 13973 F ii Donna KESLING. 8559. Carol Ann KESLING (Russel H KESLING , Martha C BERNHEISEL , Henry BERNHEISEL , Abigail MAURER , Sarah BITLER , John , Johannes ). 13974 M i John C COFFMAN. 8560. Frank KESLING (Russel H KESLING , Martha C BERNHEISEL , Henry BERNHEISEL , Abigail MAURER , Sarah BITLER , John , Johannes ). 13975 M i Frank KESLING Jr.
8564. Floyd Lee SPITLER Sr 1, 2, 3, 4 (John Sylvester SPITLER , William Alonzo SPITLER , Sarah Margaret BERNHEISEL , Abigail MAURER , Sarah BITLER , John , Johannes ) was born on 15 Jan 1918 in Preble Co, OH. He died on 29 Jan 2002 in Eaton, Preble Co, OH. He was buried on 2 Feb 2002 in Preble Memory Gardens, West Alexandria, Preble Co, OH. Floyd resided in 1930 in Ingomar & Enterprise Rd, Lanier Twp, Preble Co, OH. He worked as Preble Lumber Company (43 year employee, last 11 as owner). He was a member of St John Lutheran Church (member) in Ingomar, Preble Co, OH. He resided in Jan 1976 in West Alexandria, Preble Co, OH. Floyd married Doris Ann JOHNSON 1, 2, daughter of Frank JOHNSON and Ruie MILLER, about 1940 in Preble Co, OH. Doris was born on 3 Jan 1922 in Preble Co, OH. She died on 2 Aug 2009 in Reid Hospital, Richmond, Wayne Co, IN. She was buried on 5 Aug 2009 in Preble Memory Gardens, West Alexandria, Preble Co, OH. Doris resided in West Alexandria, Preble Co, OH. She resided in Aug 2009 in Eaton, OH. + 13976 M i Floyd Lee SPITLER Jr.
+ 13977 M ii Ronald Keith SPITLER. 8565. Irene Louise EUBANK [scrapbook] 1, 2, 3, 4, 5, 6, 7, 8 (Mary Etta SPITLER , William Alonzo SPITLER , Sarah Margaret BERNHEISEL , Abigail MAURER , Sarah BITLER , John , Johannes ) was born on 4 Dec 1912 in Lanier Twp, Preble Co, OH. She died on 4 Feb 2000 in Greenbriar Nursing Home. She was buried on 7 Feb 2000 in Twin Valley Cemetery, West Alexandria, Preble Co, OH. Irene resided in 1920 in Enterprise Pike, Lanier Twp, Preble Co, OH. She resided in Feb 1989 in West Alexandria, Preble Co, OH. She resided in Jan 1998 in West Alexandria, Preble Co, OH. She was a member of St John's Lutheran Church - Member, Women of the Church in Ingomar, Preble Co, OH. She worked as Shillito-Rike Department Store - Cook. She worked as Gearhart's Cafeteria - Cook. 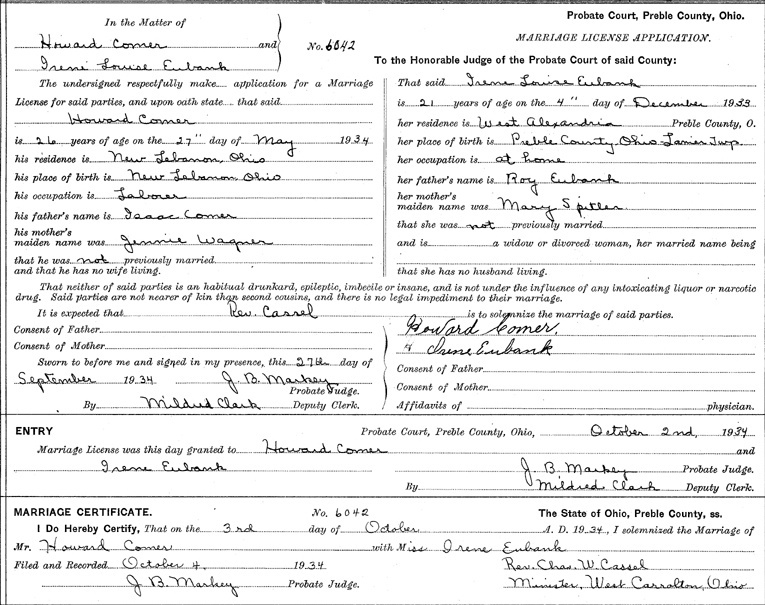 Irene married 1 Howard H COMER [scrapbook] 2, 3, 4, 5, son of Isaac COMER and Jennie WAGNER, on 3 Oct 1934 in Preble Co, OH. Howard was born on 27 May 1908 in New Lebanon, Montgomery Co, OH. He died on 16 Dec 1968 in Grandview Hospital, Dayton, Montgomery Co, OH. Donald Howard COMER 1, 2 was born on 10 Jun 1935. He died on 11 Jun 1935. He was buried in Sugar Grove Cemetery, Lanier Twp, Preble Co, OH. Ronald COMER 1, 2 was born on 10 Jun 1935. He died on 11 Jun 1935. He was buried in Sugar Grove Cemetery, Lanier Twp, Preble Co, OH. 13980 F iii Helen COMER. + 13981 F iv Caroline S COMER was born on 8 Nov 1944. She died on 29 Oct 2000. 8567. Leonard J EUBANK Sr 1, 2, 3, 4, 5, 6 (Mary Etta SPITLER , William Alonzo SPITLER , Sarah Margaret BERNHEISEL , Abigail MAURER , Sarah BITLER , John , Johannes ) was born on 13 Apr 1918 in Perry Twp, Montgomery Co, OH. He died on 23 Jul 2001 in Good Samaritan Hospital, Dayton, Montgomery Co, OH. He was buried on 27 Jul 2001 in Preble Memory Gardens, West Alexandria, Preble Co, OH. Leonard resided in 1920 in Enterprise Pike, Lanier Twp, Preble Co, OH. He worked as National Cash Register - Factory Worker from 1940 to 1975 in Dayton, OH. He resided in Feb 1989 in West Alexandria, Preble Co, OH. He was a member of St John's Lutheran Church - Member in Ingomar, Preble Co, OH. He resided in Jan 1998 in New Paris, Preble Co, OH. He resided in Feb 2000 in New Paris, Preble Co, OH. Leonard married Mildred L BELTZ 1, 2, daughter of BELTZ, about 1939. Mildred was born on 8 Mar 1924 in Springboro, Montgomery Co, OH. 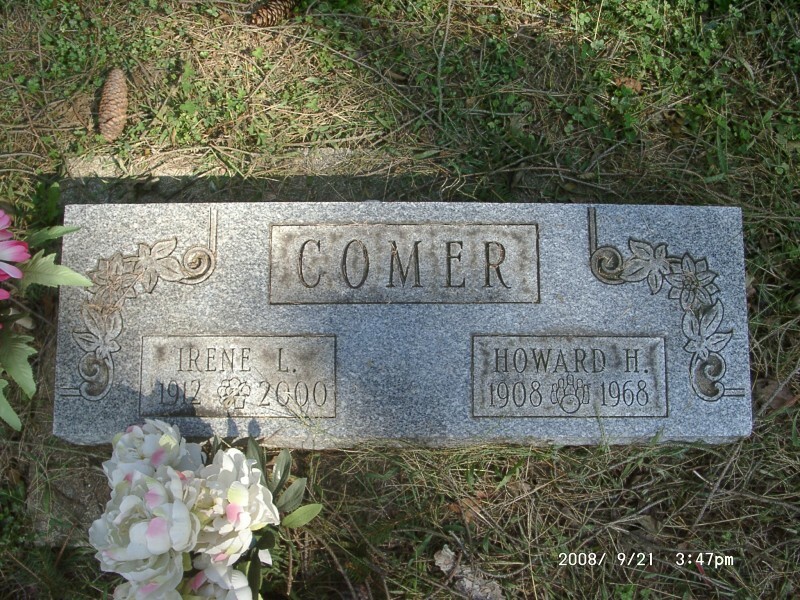 She died on 18 Apr 2009 in Vancrest Nursing Home, Eaton, Preble Co, OH. She was buried on 21 Apr 2009 in Preble Memory Gardens, West Alexandria, Preble Co, OH. Mildred worked with Rike's Department Store in Dayton, OH. She worked with Dayton Mall in Dayton, OH. 13982 M i William EUBANK. 13983 M ii Leonard J EUBANK Jr.
Linda EUBANK 1 died before Apr 2009.